This webpage is for UBC students going into first year pharmacy school. If you are going into 2nd, 3rd or 4th year, you must renew your student pharmacist registration with the College prior to the start of each new school year. See this page for details instead: Registration Renewal. 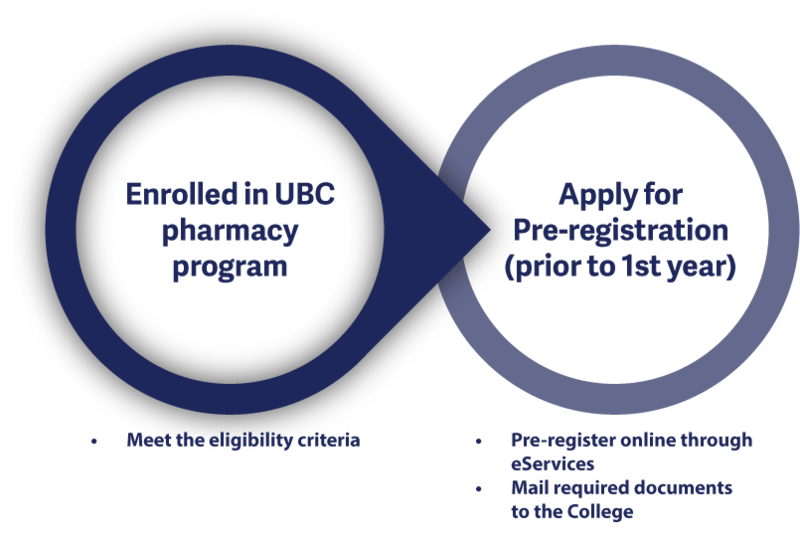 All pharmacy students from the University of British Columbia (UBC) are required to register with the College as student pharmacists prior to the start of their first year. Student Pharmacist registration allows students to undergo their structured practical training, or to provide pharmacy services while under the supervision of a full pharmacist. Pharmacy students must maintain their registration throughout the length of their pharmacy program by completing their online renewal prior to the start of each school year, and may apply for Full Pharmacist registration after graduation when they have met all the requirements. Enrolment in the undergraduate program with the Faculty of Pharmaceutical Sciences at the University of British Columbia. Review the General Registration Information for Student Pharmacists before beginning the application process to ensure you have all the correct documentation required for your application. If the names on your documents are inconsistent and a name change or marriage certificate cannot account for the differences (e.g. different spelling), you must provide a notarized affidavit (see sample affidavit template). Acceptable documents include: Canadian birth certificate, Canadian citizenship certificate or card, Canadian passport, Permanent Resident card or work permit. Letter of Standing sent directly from each of your previous regulatory bodies if you have been registered in a health profession in any other jurisdiction. Letters(s) must be dated no earlier than 3 months of receiving your application. If you were registered elsewhere but you are unable to provide a letter of standing, you must submit a notarized affidavit (use the​ sample affidavit template).​ If you have never been previously registered as a health professional, a letter of standing is not required. Once your application is complete, a notification email will be sent to the email address which you used to register for your eServices account. Ensure your email address under the “My Profile” tab on eServices is up-to-date. Add the College’s email addresses to the Safe Sender List if necessary. You will need to complete the required assessments in the last year of your pharmacy program before applying for Full Pharmacist registration. Review the information on the New Pharmacist > Student Pharmacist (UBC) page before registering as a Full Pharmacist.